CFB TRENTON—It survived 14 combat missions over Nazi Germany, but the RCAF feared it wouldn’t survive yet another winter in the New Brunswick woods. So last spring 20 volunteers from CFB Trenton arrived in the woods just outside Edmundston, N.B., armed with all the tools required to dismantle the big Lancaster bomber KB882, load it on eight flatbed transports and haul it off to a more comfortable life in Trenton’s National Air Force Museum. Now those volunteers are working daily in the museum’s back room putting KB882 back together and returning it to its original splendour. It’ll be unveiled at ceremonies in 2024 saluting the100th anniversary of the Royal Canadian Air Force. The maintenance technicians were rather surprised by KB882’s structural health when they got the bomber to Trenton. For that, they can thank Troy Kirby. Kirby is not an Air Force veteran, nor an airframe expert. He’s merely an airplane fan, like his grandmother. Kirby was still eight years away from being born when this Lancaster bomber rolled to its final stop in 1964 on a grassy strip just outside Edmundston. It was retiring to be a war memorial after 19 years of tough flying conditions in Canada’s High Arctic, where it flew patterns making maps of the vast region to update the navigational maps Sir John Franklin and other explorers relied on to first venture into the Arctic Region. The .50-calibre machine guns protruding from its nose and from a glass bumble on its tail had been replaced by high-resolution cameras to record the North and spy on Soviet research camps and submarines surfacing though thick ice to spy on us. Kirby grew up listening to his grandmother’s stories about being a plane spotter in Britain during the Second World War. That spurred his love of historic war birds and his large collection of Second World War aircraft paraphernalia. 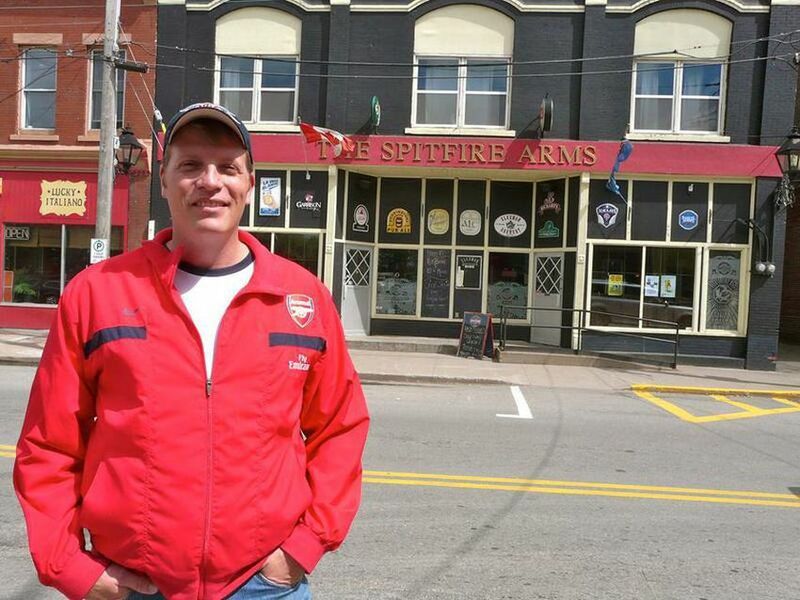 He kept his collection on the second floor of the Spitfire Arms Alehouse he operated in Windsor, Nova Scotia. He has since sold the pub. When he learned about the Lancaster bomber sitting unprotected through 54 New Brunswick winters Kirby organized volunteer maintenance parties that put in hundreds of hours caring for the bomber and started a campaign to find it an indoor shelter. He knew only 17 of the 7,377 Lancaster Bombers built during the Second World War still survive as complete airframes. Victory Aircraft built 430 of those Lancasters, including KB882, at its plant in Malton. Nobody was happier than Kirby to see the RCAF step up and bring KB822 under its protective wing, even though it meant losing the airplane to Ontario. When the Lanc is ready to show its new face it’ll join 35 other retired Canadian military aircraft on show at the museum, including the first airplane bought by the military in 1914. The Lanc will then share the spot light with another war bird that also tried to avoid being in the spot light during its war days. But the search lights did find the big Halifax Bomber NA337 as it dropped supplies to the Norwegian underground when Norway was occupied by Nazis troops. Enemy flak hit its right wing fuel tanks and started fires in its two starboard engines. The British crew crash landed their plane in a fjord and all survived the crash, but five of the six crew died of hypothermia in the cold water. Tail gunner Thomas Weightman went back into the sinking wreck to release a rubber dingy that was to release on impact. He made it to shore, but was caught by Germany soldiers and interned as a PoW. On the night of the crash on April, 23, 1945 — two weeks before the end of the Second World War — 16-year-old Tore Marsoe watched the Halifax fly over his house and plunge into the fjord. Forty six years later in 1991 he and a friend went searching for the bomber and found it under 650 feet of water. Norway gave Canada permission to retrieve the bomber and in 1995, 50 years after the crash, it was raised to the surface. Standing on the beach to watch the bomber break the surface of the water was tail gunner 73-year-old Thomas Weightman. Later that day Wightman’s coffee thermos, still containing coffee, was found in the tail gunner’s turret. 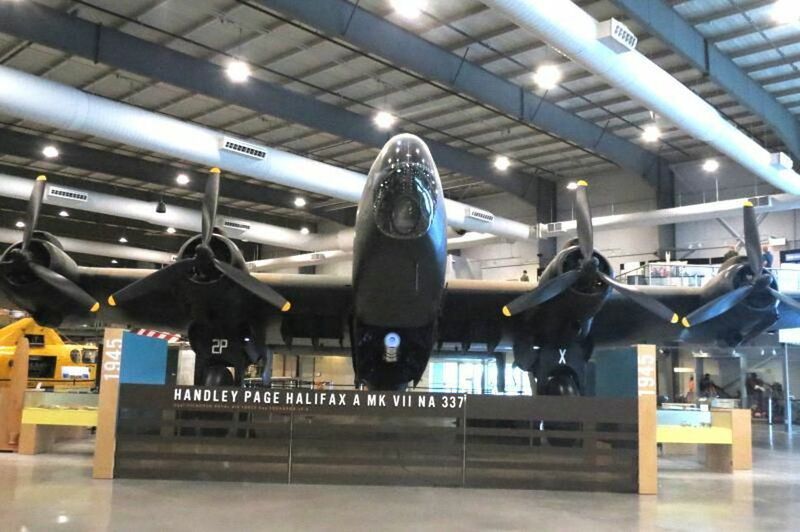 It took nearly 10 years and 335,000 hours of work by 100 volunteers at Trenton to restore the Halifax bomber to showroom condition. Pat Brennan was not sponsored for this trip.